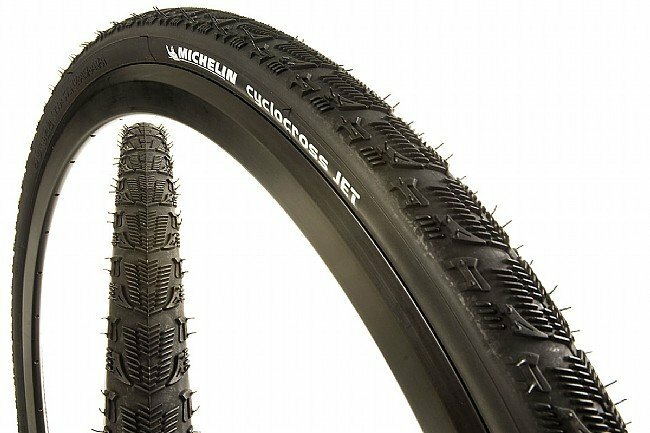 Derived from the super fast Michelin Jet S MTB tire, the Cyclocross Jet benefits from the same tread design, ample cornering knobs and advanced Silicium compound. For courses with a mix of terrain, some racers use the Jet on the back with the Cyclocross Mud2 on the front. Front or rear use. Folding, black, 700c x 30mm, 72 psi max, 340g. We use our cyclocross bikes on the crushed trails and occasionally on the road.Do not need overly aggressive tread so theses fit the bill.Still sufficient grip and less noise on the asphalt.Will know about wearing properties once more miles pass. I've gone through several sets of these over the past 5 or 6 years, since they went to this tread design. I don't consider this to be a CX race tire. As you would expect with a file type, are not good on wet grass or anything greasy, On hardpack they have good grip. They have a fairly tall, high volume casing but to me they are squirmy at low pressures. Good enough for jumping in the woods here and there or after work training, but more of a make do than a go to for that. Love them for dirt road adventure riding though. I run them at 50-55 psi and they roll great, ride nice, but let you have way more fun then you would have doing the same ride on a road tire. And on paved sections they are much better than you'd expect. I've tested them with a PM against low end tubular road tires and JRA at 18 mph on a paved road they are within 10 watts. These stay on my fender bike and cross bike all winter and spring. Rubber is soft, so tread life is not great, and they are not the least expensive choice, so 3.5 stars for value. 9 of 27 customers found this review helpful. Throw it on the back. I throw it in the bag with this one. I like to run this tire in the rear when the course is a little bit dry, keeps me moving effortlessly and provides just enough traction to keep me up right. It really is totally enough, I'll be ridding up when you are runnin up. Purchashed these tires for road and dirt riding. Tires are very fast and grip very well. Did not use these tires in mud yetc but imagine they would do ok. Great all around smooth fast tire. Great light weight tire for dry off road or all weather paved riding. Great light weight tire for dry cross conditions on moderate terrain or great for all weather riding on paved surfaces. I use this tire for fast winter commuting on pavement and for unpaved hard or gravel training rides. Easy to mount, smooth ride, moderate durability. Good overall value in a versatile tire.